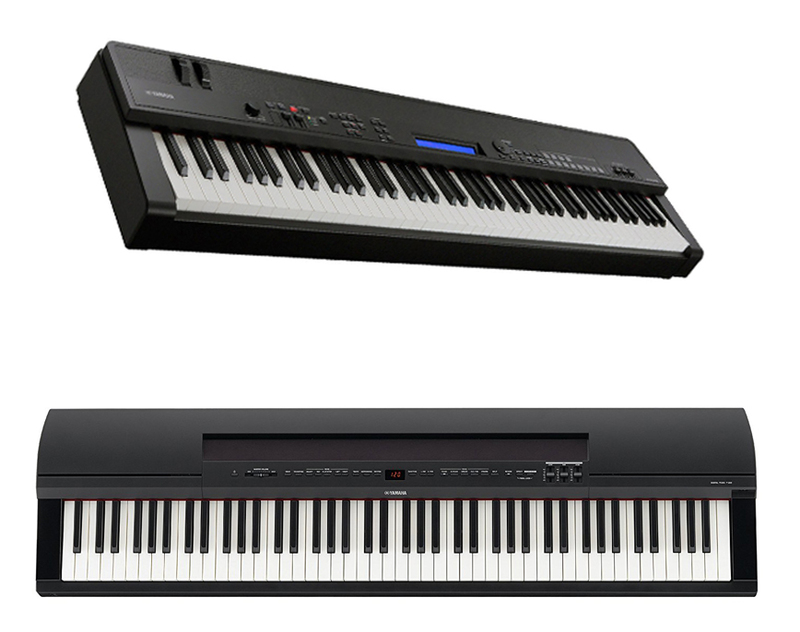 Yamaha CP40 and P255 are two full sized keyboards from Yamaha that were aimed at professional players with more complicated and advance sounds. 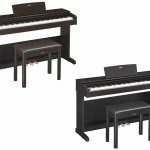 Both pianos have some similarities but one of them is better and of course pricier. If you are currently looking for a high-class piano to accompany you during your next performances, you may want to check our article below. Yamaha CP40 is a one of the most recent piano from Yamaha CP line after their first product in 1976. Coming from this well know brand, you can expect rich features and great sounds from the piano. This line initially consist of “electric-grands” to allow performers perform their music on the road. 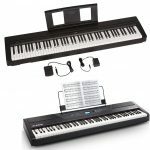 If you wish to own a digital piano that is reliable and portable enough to be carried around during your performance without breaking the bank, you may want to consider this one. 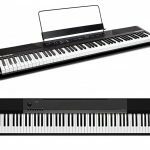 From the outside, Yamaha CP40 looks just like its older brother CP4, but without the price since this one is more affordable. At the top of the piano, you will see an array of function that you can use conveniently. As you can expect from Yamaha pianos, the sound in this one is recorded from Yamaha premium collection grand pianos, the Yamaha CFIIIS together with 88 weighted hammer key for more realistic feeling while playing the piano. Another great thing in the unit is it has a memory to store you favorite sounds, such as the piano, strings, organ, clavinet, pads, and bass, so it means you can draw on a wide range of music needed during your performance. 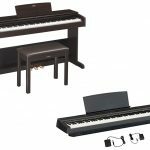 Yamaha P255 is one of Yamaha high-class piano that you can use either at home or on the road. Even when you don’t try to play the unit yet, you may already lay your eyes on it because of how beautiful the build is and the subtle classy appearance. 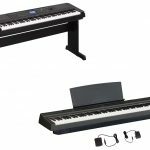 The price isn’t fall into the affordable side and is clearly not aimed for starters or beginners but for those professional who need more and better piano to accommodate their music this one will be a good investment. 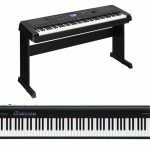 Yamaha P255 comes in two different colors; the matte black and ivory white. At the top center of the unit, you will find 7 segment LED backlit display with red lighting as well as some button for voices, reverb, sound effect, and many more. 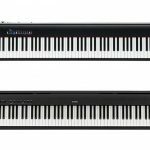 The focus of Yamaha P255 is to bring the most realistic sound an electric piano can gives to deliver the best experience for both performer and the audience. It comes with 24 preset tones including 4 grand pianos, 4 electric pianos, and 4 organs together with various sounds. When you try the piano, you will immediately notice how good the sound it can produce, which is of course taken after the CF model and this one is actually very accurate version of Pure CF Sound Engine. Yamaha P255 also featured with Graded Hammer system with 256 polyphony notes to even further mimic real grand piano. Another useful feature is the app controller for iOS devices, which is great to control the piano to layer, split and change to other voices as well as managing presser songs. 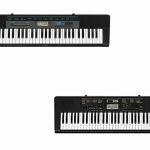 Now, let’s compare Yamaha CP40 with Yamaha P255. Both pianos falls into professional grade pianos for performers rather than novice users. 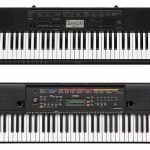 What set the apart from each other is the polyphony count, Yamaha P255 is superior with 256 notes while CP40 only have 128 notes. Another thing set bot piano apart is the speakers in Yamaha P255 that were placed on the rear of the keyboard, so you don’t need external amps. All in all, the decision is all yours to make. 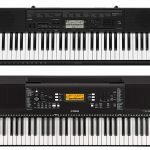 In our opinion, Yamaha P255 is better since it is ready to be played even when used without amps while the polyphony counts also superior and gives you the better experience of a real grand piano.